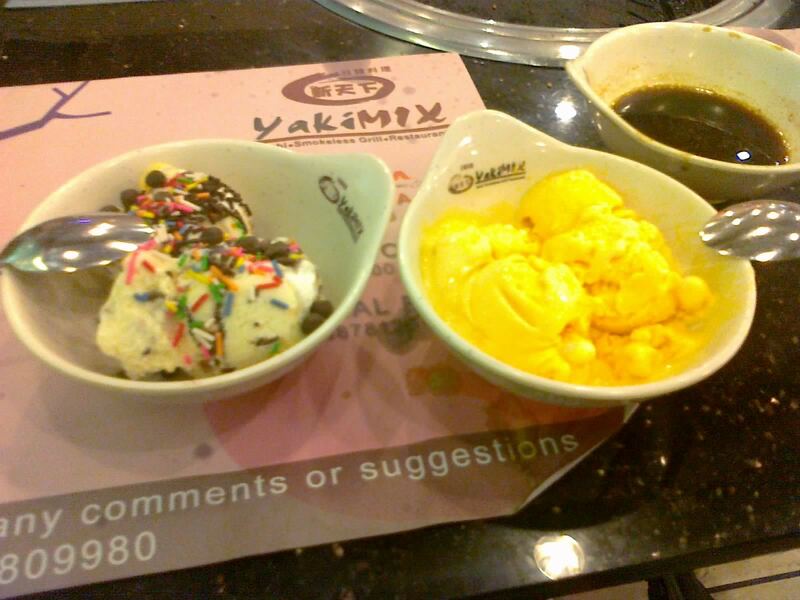 Beloved and I went to YakiMIX for dinner a while ago. I’ve been clamoring to go here ever since I saw some pictures posted by some of my contacts of food from the place. 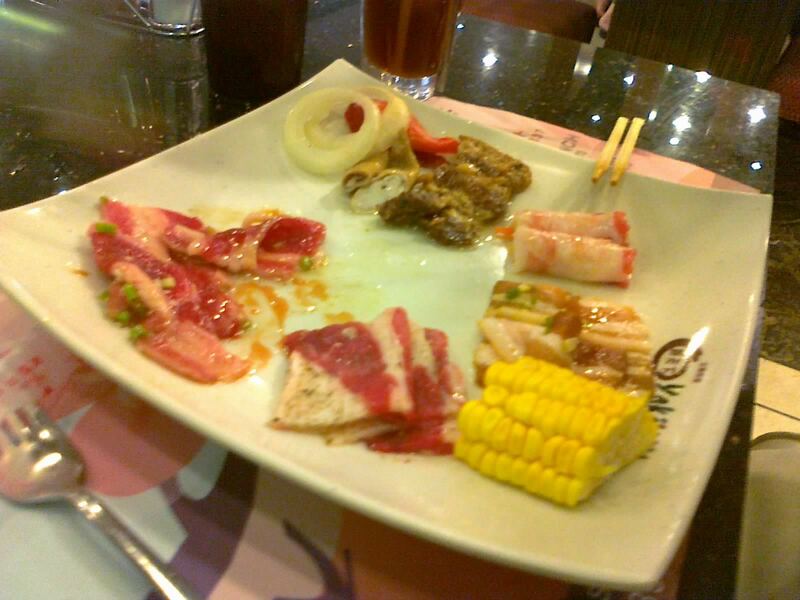 We had knowledge that this was a Japanese buffet specializing in sushi and barbecue (yakiniku). We also had knowledge of how much we’d be spending, which is a little over 600 for the unlimited food and drinks. We also had knowledge of what time it opens, which was from 6 p.m. to 11 p.m. for dinner. What we didn’t have knowledge of was how popular this place was and that the queue time would be an hour at least. After going to the nearby Kozui and Baang coffee shop to kill some time and a bit of our starvation, we went back to find out the queue was extended. There were many other patrons waiting besides us, but luckily, since there was only two of us, we got accommodated for at 8 p.m.—almost two hours from the time we came. Was it worth the wait? There was no menu, of course. The buffet costs 580 php per head for adults and unlimited drinks costs 55 php, which you’ll probably want to get if you’re going here anyway. 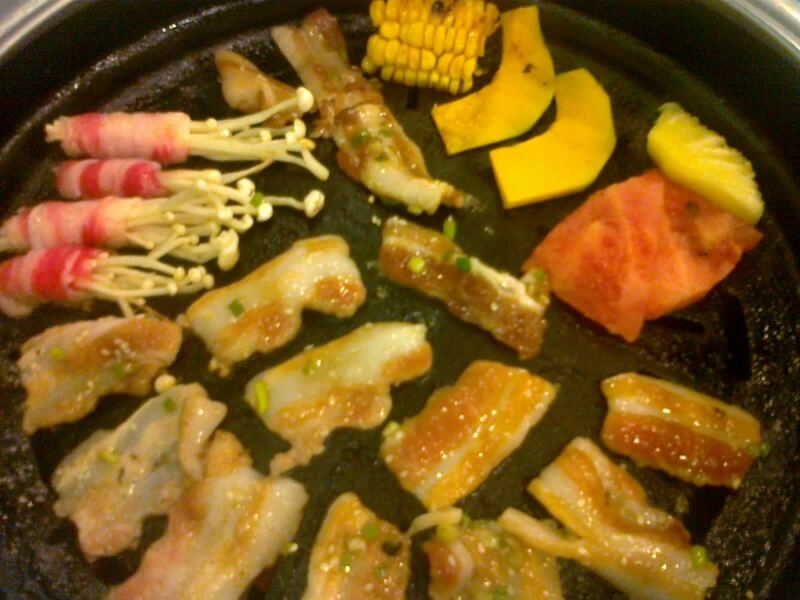 What differs from your usual Saisak.. er… Japanese buffet is that every table comes with a smokeless grill where you can cook stuff yourself. Extremely hungry, we dove in immediately. First, we got plates of their sashimi and maki. 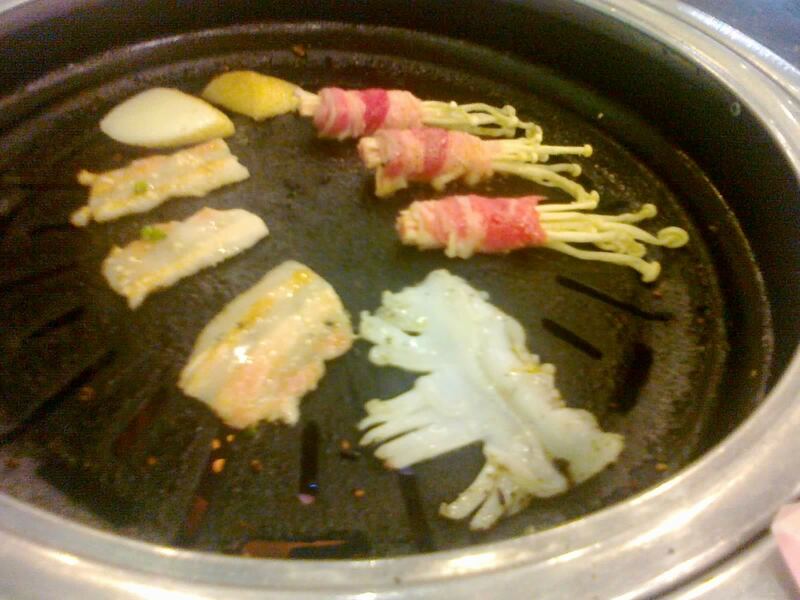 Their sashimi were generous slices that you can optionally grill if you don’t want it raw. We didn’t, of course, except for one experimental piece only to find out the grill wasn’t turned on yet. 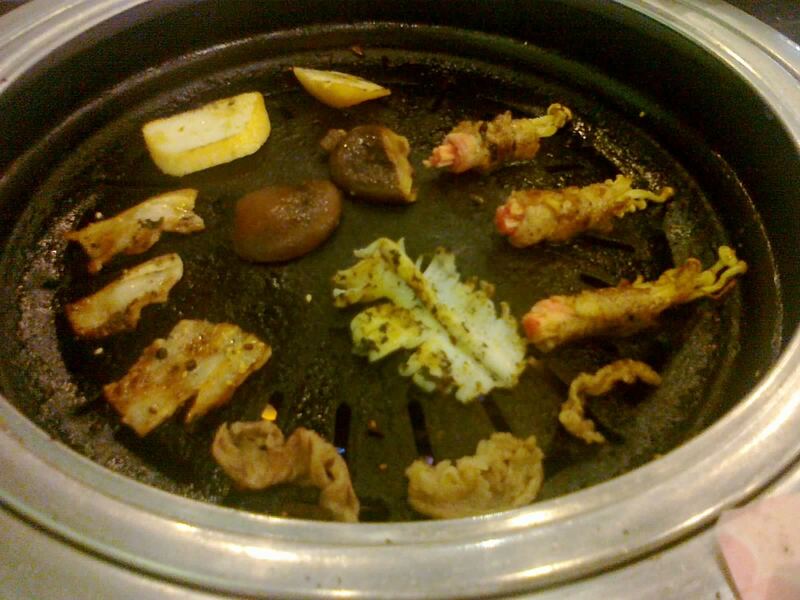 The service was very good, however, and they opened the burner seeing our failure. 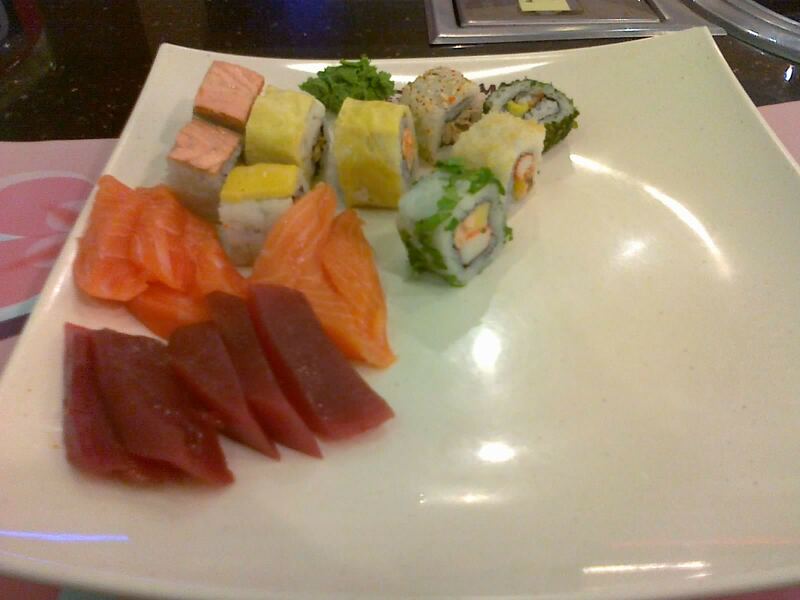 That aside, the sashimi, while lacking in variety, was deliciously fresh. Beloved’s tuna was so freshly cut that it seemed to bleed. As for their maki, they came in a lot of varieties, reminiscent of that of Omakase. We didn’t bother canvassing their names, though. Beloved probably chose based on outward appearance, taking a few pieces with the egg on the outside. I took one of each that was currently available. Texture-wise, they were quite complex rolls. Some were crunchy, some were chewy, some were soft, and some were a combination of at least two. Taste-wise, aside from one that didn’t agree with me because of an overpowering spicy flavor, they were delicious. Note that we were extremely hungry at this time. Beloved wanted miso soup; sadly, there was none. They did have other soups, though—sukiyaki, corn soup, and another that I got beloved. 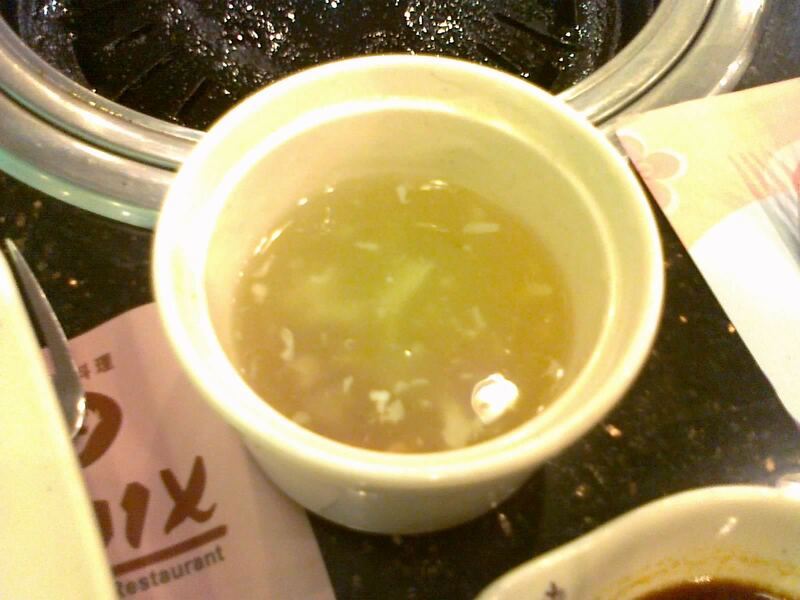 At first she complained that it tasted weird, but after I revealed that it was wintermelon soup, she consumed all of it. We went from having their sushi to their barbecue. An entire side of their buffet table was dedicated entirely for this purpose. 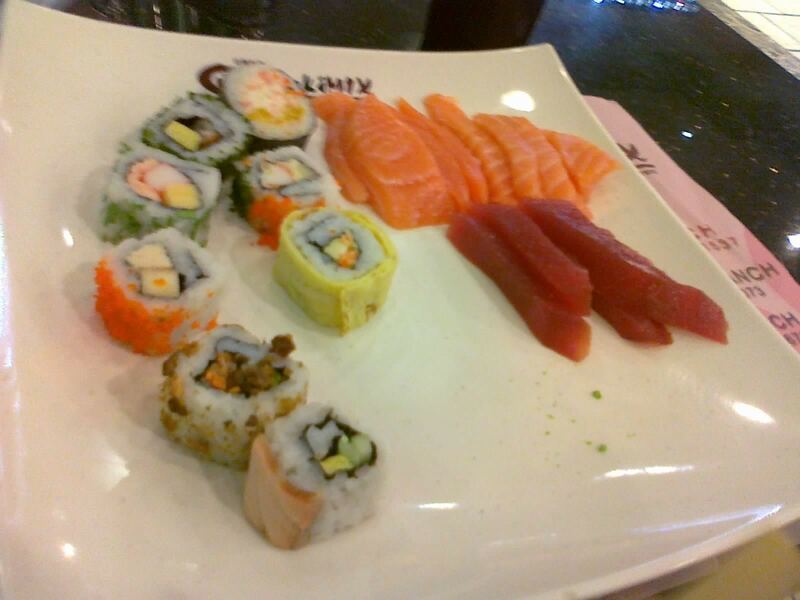 They had raw meat, raw fish, raw veggies wrapped in raw meat, and raw vegetables. Most of the meat was the belly part. In layman’s terms, most of the meat was bacon, which made me very happy. 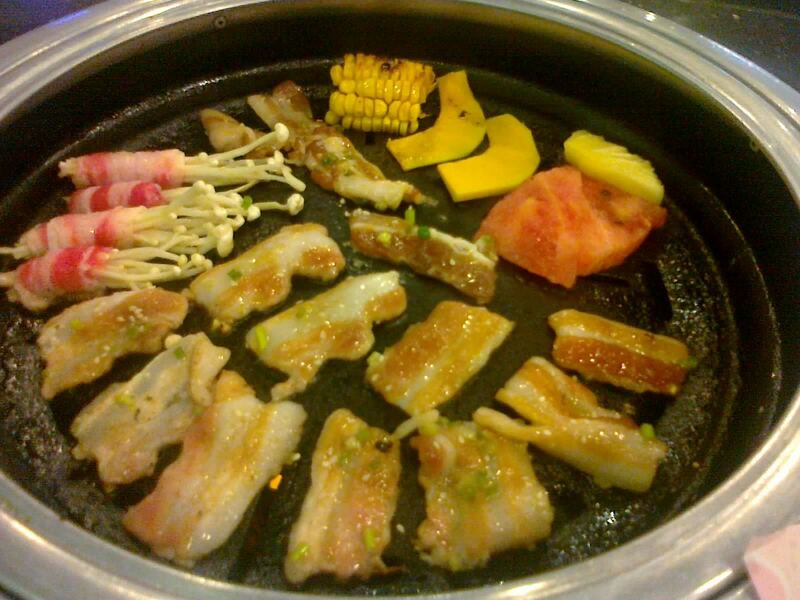 They had bacon from pigs and cattle from different places marinated in different sauces. I sampled three of them. I also got beef, stuff wrapped in bacon, pig intestines, onions, peppers, and corn for my first plate. 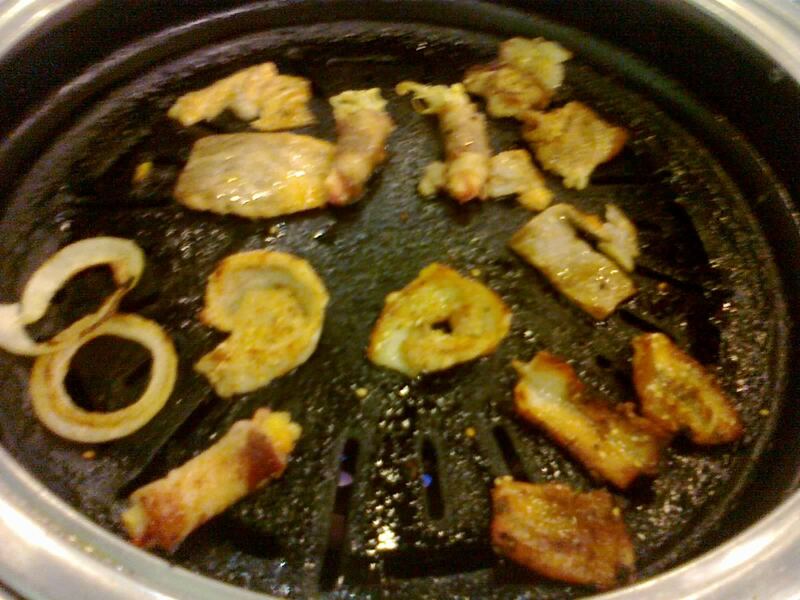 I also took their barbecue, one pork and one chicken. It takes only a short time before they cook and become ready to eat. I’d advice not to use the same plate you get the raw meat and the one you’d be eating from, though. At first, it’s pretty hard managing cooking and eating at the same time, but it was fun. Also, you can’t go wrong anyway since the heat isn’t bound to burn your meat unless you leave them for a very long time, which I doubt will be happening once you smell the grilled meat. Tasting them made it even better. They tasted great individually, all with the hint of a smoky flavor. While my first plate had mostly meat on them, beloved had mostly fish. She also managed to get a couple of pieces of mushrooms wrapped in beef. This instantly became her favorite. I found them to be quite good as well. Perhaps, next to the numerous variety of bacon, this is my favorite item in the barbecue section. What was my favorite? The pork bacon, of course. Our next plate consisted of our favorites—beloved’s beef-wrapped mushrooms and my generous heaping of bacon. We also took some fruits to play with. Yes, that’s a couple of slices of watermelon, a slice of pineapple, and a couple of slices of sweet potato. There’s no rules saying they’re not allowed, so we did so. Oh, and the corn was the one I had on my second plate as I wanted it to be charred which wasn’t happening. From this, I discovered that grilling watermelon gives it a sweeter flavor with a touch of smokiness; in other words, very delicious. 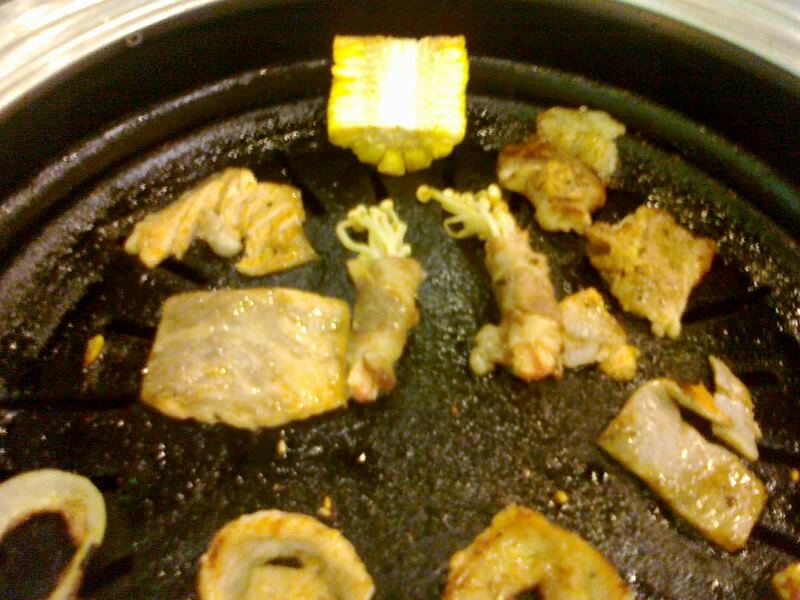 The pineapple also turned out much sweeter when grilled. Beloved went back for kani salad. They had a side dedicated for that. 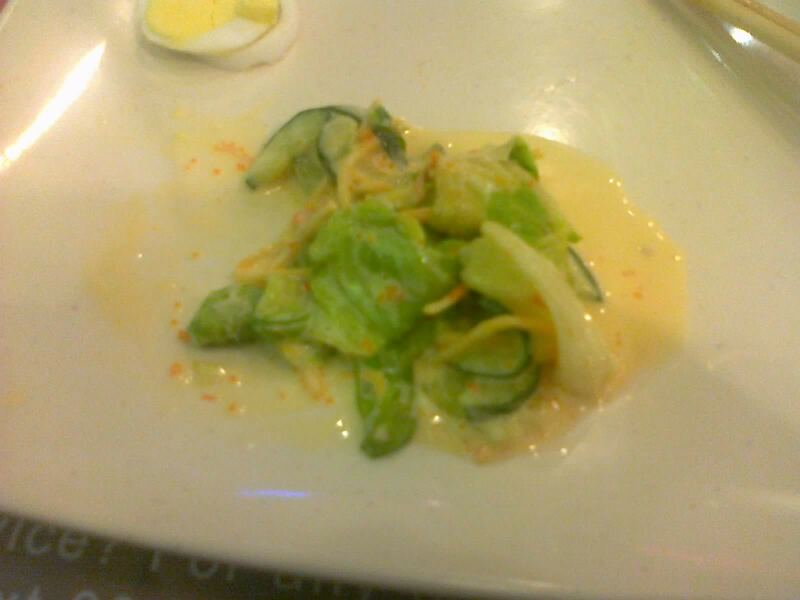 There are a few veggies and dressings you can make your salad of, and there was the kani salad. She also grabbed a few slices of kani and tomatoes. We grilled them, of course. Not much change from having them raw, though. 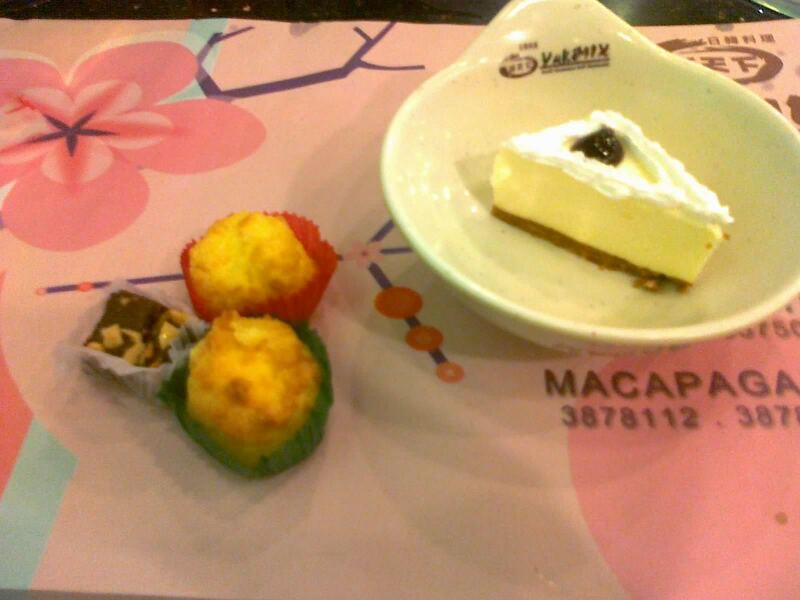 After finishing this plate, our bellies were kinda full, so we went to their desserts. While the only fruits they have were watermelon and pineapple, they had ice cream and an assortment of cakes and pastries. They also had toppings for their ice cream. Beloved got a couple of macaroons and brownies, and a cute slice of blueberry cheesecake. 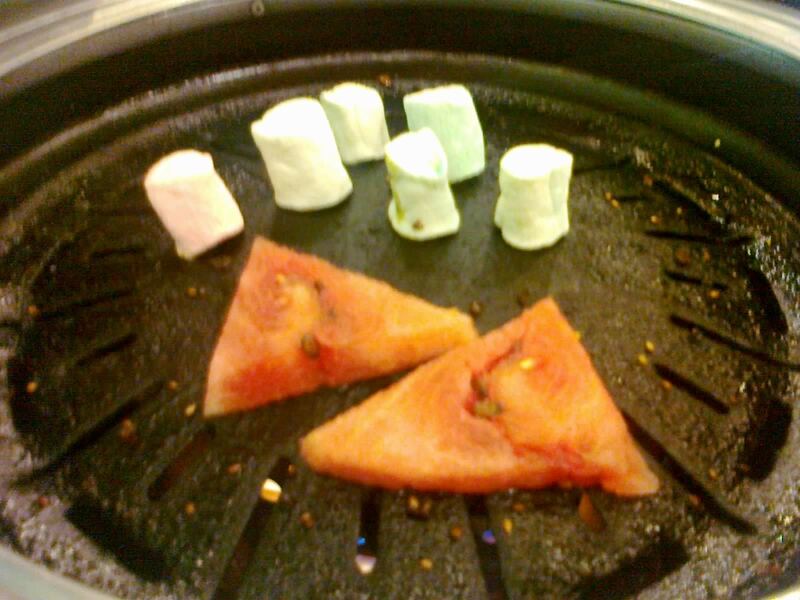 I got a couple of slices of watermelon and some marshmallows which was meant for ice cream toppings. I grilled them, obviously. Grilled watermelon might now be my favorite fruit. And while the marshmallows didn’t really turn out to be like the delicious crunchy-on-the-outside-and-melting-hot-on-the-inside, it was a fun try. 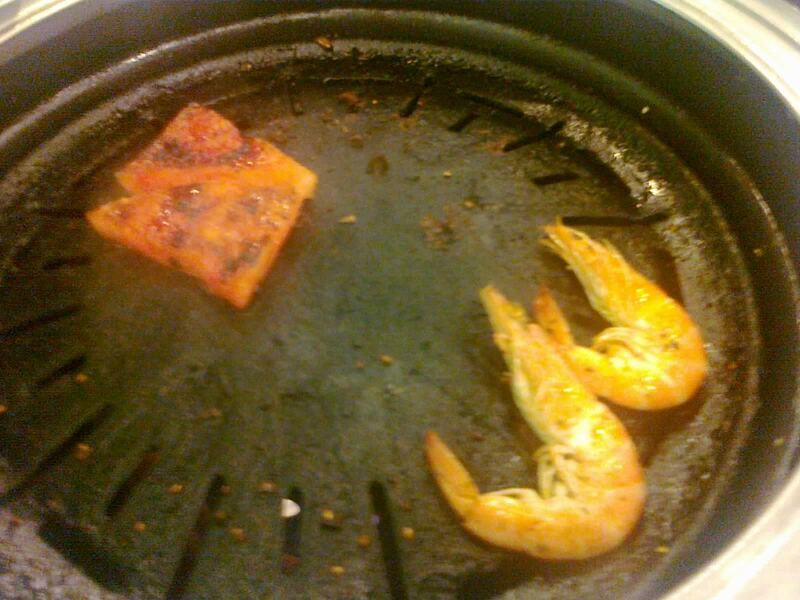 While waiting for them to cook, I went back to see if they had prawns, which was always empty when I went around. This time, it wasn’t. I was pretty full, so I only got a couple of them. I also sampled a single piece of their tempura just so I can compare it with others. The tempura had a little bit too much butter in their batter. Other than that, it’s still one of the better ones I’ve had. 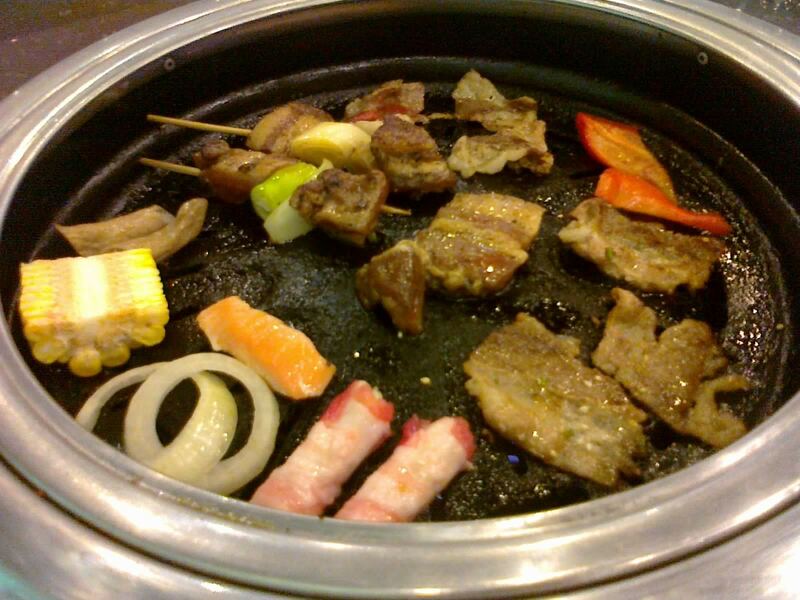 One advantage of this grilling-on-your-table style of eating is that you don’t get to eat continuously. This makes the food go down a bit and you’re hungry again after smelling the food and seeing what the other table has gotten. So we went back, beloved got three more pieces of the mushrooms wrapped in beef and I got a few more slices of bacon. We also got a piece of cuttlefish and kikiam. 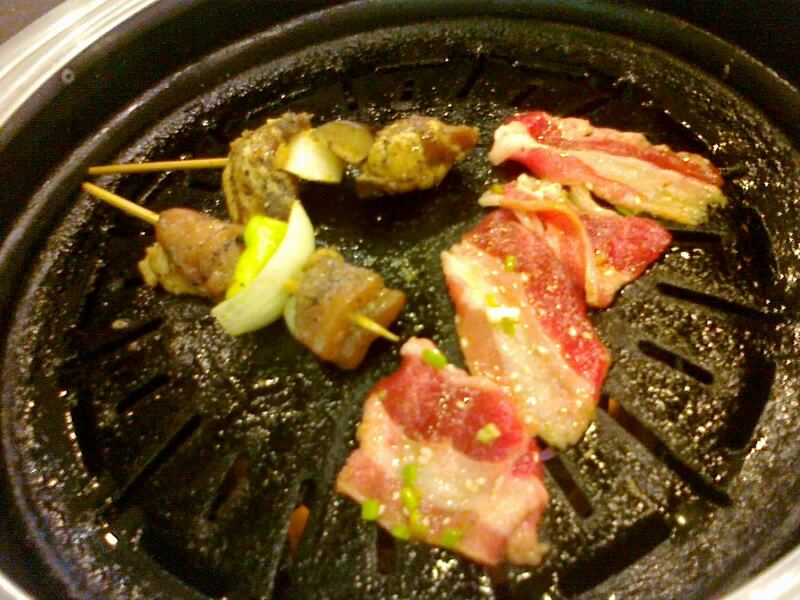 I also sneaked in a couple of mushrooms and sukiyaki beef that was meant for their sukiyaki. I grilled them. Who’s to stop me? This was a bad idea, though, as the mushrooms didn’t turn out as good as I expected and the beef was already cooked, so it only made them harder and a bit tasteless. Maybe these were really meant for sukiyaki. After a last few slices of bacon, we finally went for our last dessert. We had ice cream. Beloved got double dutch topped with sprinkles and chocolate because this was the last time I’ll allow her to eat ice cream in three months. I got the yellow one which turned out to be mango. If it was cheese, beloved would’ve taken it as well. They also serve ice cream sticks which comes in chocolate, melon, and fruit flavor. I helped myself with a stick of chocolate. So, to answer my own question, was it worth the wait? Are you kidding? Eat all you can bacon among other (delicious) stuff, of course it’s worth the wait! The two hours of idle wait was compensated with two hours of delicious and fun (yes, fun) food. I find it worth the price too. This is probably the best buffet I’ve had in this price range where I don’t run out of fresh sashimi and I get to cook my food in front of me. While I still find buffets which have practically everything and costs four figures more delicious, the fun factor the grilling-it-yourself adds tightens the gap between. There’s practically nothing I didn’t like, and for those afraid to cook their own food, they have a generous selection of already cooked food. While I didn’t get to taste them, I imagine them to be good as well. That aside, while I’ve been dying to try this out, now that I’ve tried it, I can’t imagine myself inviting other people for dinner here just because of two things: first, the price tag—it’s still quite a lot for buffet; and second, the fact that eating here will guarantee a couple of digits of weight gain in pounds. Even though I find it worth it, some people might not. However, if someone else invites me here, I’d gladly come if I have the money to spend. When that next time comes, I’ll make sure to reserve beforehand. Recommended for: Starving meat lovers. Not recommended for: Full vegetarians. Reserve beforehand, their contact numbers are 3939100, 3857500, 3328073; 2. Don’t go here if you’re not hungry; 3. Don’t consume too much rice; 4. 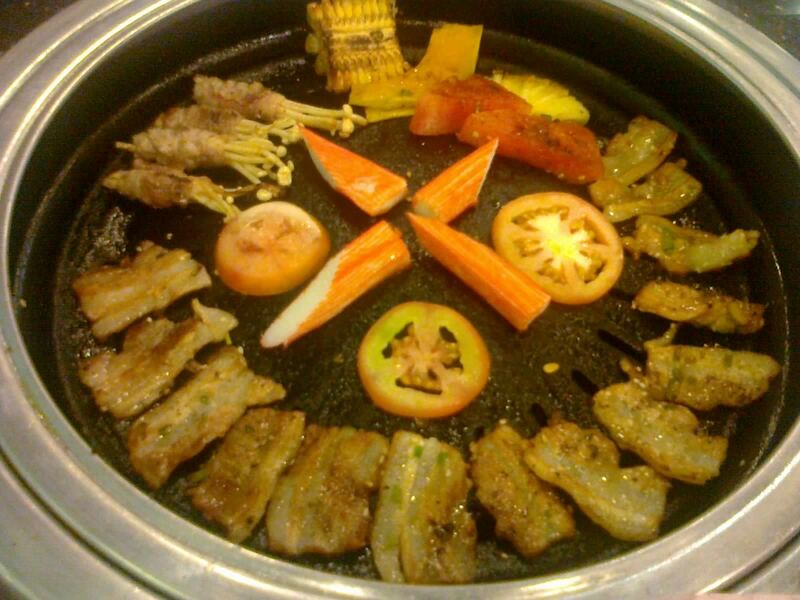 Avoid mixing raw and cooked stuff in a single plate; 5. Do not touch the grill; 6. Bacon is delicious whatever meat they come from and wherever place they’re raised from and whatever sauce they’re marinated in.